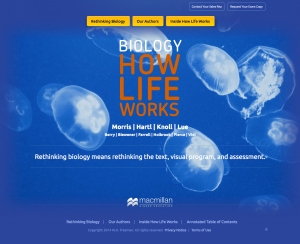 Associate Professor of Biology James Morris, together with several faculty members from Harvard, has recently written a new textbook, titled Biology: How Life Works, a book that seems likely to become a standard for teaching introductory biology to college students. Senior honors presentations and defenses for Biology and Neuroscience are this week and next Monday. Faculty research mentor (emphasized) is chair of the committee.